Lattimore playing for the Bears in 2014. Lattimore played running back and linebacker for the Cedar Shoals High School. He recorded 96 tackles, four sacks and four forced fumbles his senior year. He was also named to the 2008 Georgia All-Star team and the All-Northeast Georgia team. Lattimore earned two Defensive Player of the Year honors in Region 8-AAAA. He rushed for 857 yards and six TDs on 88 carries his junior year. He also recorded 118 total tackles, 15 sacks and 18 quarterback hurries in 10 games. Lattimore played for the South Florida Bulls from 2010 to 2013. He was redshirted in 2009. He earned Freshmen All-American Mail Kailper in 2010. He earned second team Big East Conference 2011, 2013 second-team American Athletic All-Conference honors, was named USF Team MVP and was a team captain his senior year, leading the Bulls with a career-best 98 tackles. Lattimore was signed by the Chicago Bears of the National Football League (NFL) on May 11, 2014 after going undrafted in the 2014 NFL Draft. He was released by the Bears on August 31 and signed to the team's practice squad on September 1, 2014. 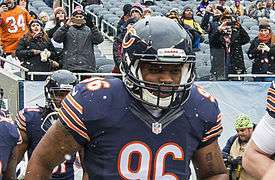 He was released by the Bears on September 11 and re-signed to the team's practice squad on October 8, 2014. Lattimore made his NFL debut on October 12, 2014 against the Atlanta Falcons, recording one tackle. On January 30, 2015, he was resigned to a two-year deal. He was waived by the Bears on August 15, 2015. Lattimore signed with the Saskatchewan Roughriders of the Canadian Football League on February 19, 2016. He was released by the Roughriders on April 19, 2016. 1 2 "DEVEKEYAN "DEDE" LATTIMORE". gousfbulls.com. Retrieved October 13, 2014. ↑ "Chicago Bears Transactions - 2014". espn.go.com. Retrieved October 13, 2014. ↑ "DeDe Lattimore". nfl.com. Retrieved October 13, 2014. ↑ Wilkening, Mike (January 30, 2015). "Bears sign LB DeDe Lattimore to two-year extension". Profootballtalk.com. Retrieved January 30, 2015. ↑ "Chicago rookie WR Kevin White needs surgery on leg stress fracture; will miss half of season". Associated Press. usnews.com. August 15, 2015. Archived from the original on September 20, 2016. Retrieved September 20, 2016. ↑ "Saskatchewan Roughriders add three players to their defence". leaderpost.com. February 19, 2016. Archived from the original on February 28, 2016. Retrieved February 28, 2016. ↑ "Defensive tackle Brandon Tennant among 10 players released by the Saskatchewan Roughriders". leaderpost.com. April 19, 2016. Archived from the original on June 8, 2016. Retrieved September 20, 2016.